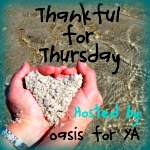 S.A. Larsen, Award-winning author of middle grade & young adult fiction: OASIS Thankful Meme! I know you normally don't hear from me on Thursdays, but I couldn't resist supporting Oasis for YA and my blogging sisters. Today Oasis for YA joins the ranks of the Meme owners!! See our new Meme! Isn't it beautiful! The lovely Jessie even went down to the beach in Florida to take the warm tropical photo. Just love it. We figure that there is something to be thankful each and every day. Times when your work is validated through receiving a request for material or when you finish plotting your next best novel. And what about when one of your children does something that reminds you why you wanted children. Then there's Mother Nature and how simply sitting and listening can make you feel alive. You can even be thankful when times are tough. And yes, even more so then. So join us every Thursday in being thankful for something, someone, or whatever else your creative minds can conjure. The only criteria is that you use our Meme logo and be thankful. That's it. You don't have to write YA. All genres are welcome. We are a writing community. Let's be thankful for that. I am, and I thank you for your support in advance.